I would love to say that the raw material of this turning is from some exotic location given to me by private collectors... Actually, it is from a neighbor's yard. A full day of laboring with my neighbor yielded a few pieces of sufficient size that were not rotted through. Yews are some of the prettiest woods to turn. Their colors run from a deep honey brown to purple to reddish-orange. 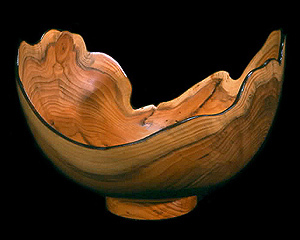 This piece of wood was intentionally turned to include bark inclusions, fresh growth sapwood (the lighter colors on the edge) and knots, and is finished off with a very thin wall. With its fire-embellished bark edge, this piece is a unique and yet functional bowl, weighing in at a mere 4 ounces!